Everyone wants to earn extra money to fulfill their wishes. Having extra money is always a good thing. It’s good to have some tricks that can help you to earn extra pocket money. Have more, spend more. 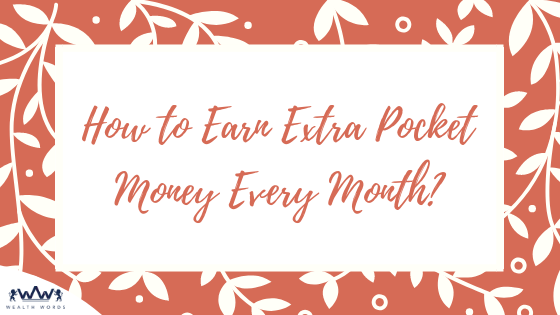 Apart from your regular job or business, here are a few ways to earn extra pocket money every month. Have you ever thought of earning a few bucks from your hobby? Ever thought about it? Now, it should not remain a daydream at all. If you love making handicrafts in your leisure time, you can sell them online in an online store. This helps in earning a good amount of money. You can earn more money by simply listening to the song and writing reviews about the same. There are a few websites that pay you a fixed amount. Write genuine reviews regarding the songs and get paid. You can play games and earn real money, right from your computer! Some websites are completely free to join and where you can play games to win some real cash. Playing games on the internet for cash won’t make you an instant billionaire. But, it will be fun to make money by playing games. If you feel you are creative and can come up with a good birthday, anniversary, holiday, baby shower or other occasional wishes, you can easily make money online. Yes, that’s true. This sounds like real fun, isn’t it? Writing greeting card wishes is very short and to the point job. You only have to write 3-4 lines. The greeting card company will approve your submission if you write it beautifully. Why not make good use of your car? Earn by renting, no matter what car you have. Have time? Drive yourself or give it to some other driver. You can go for carpooling as well. Teaching will always be considered as one of the noblest professions of all. Nowadays, many students prefer studying on the go with the help of digital media. If you have that passion and knowledge, go for it. Satisfying as you are shaping the career of the students. You only need a device and a good internet connection. Creating a YouTube channel and earning money is something that has become popular nowadays. If earning money from YouTube fascinates you and have the desire to do the same, go for it. Gain an audience and have a good number of views/likes on your videos to earn. YouTube is the world’s second largest search engine after Google. YouTube helps anyone earn from an entertaining, informative and engaging videos. So, you only have to explore what you are good at. Go for it and earn real money to fill your pocket!! Reward Websites are also known as incentivized freebie websites, Get Paid To Write reviews about the websites. These sites will pay you some extra cash or gift cards just for completing small fun tasks like watch videos, refer friends, complete bonuses, sign up for offers, take surveys, and even play games for some extra cash. Write Articles isn’t one of my favorite ways to make extra money, but it does work. Even if you don’t aspire to be a blogger, you can still earn real money by writing articles or blogs only if you have decent writing skills. In fact, people with decent writing skills often use their talent to earn extra money online by writing for others. The best part about writing articles is that the need for them just growing continuously. Conclusion: How to Earn Extra Pocket Money Every Month? If you are creative enough, there are plenty of money-making websites waiting for you. There is another way too, apart from paycheck-to-paycheck where you’ll have a chance to earn real money to buy what you want. Try above given some approaches, from where you can easily earn up to $100- $150 or more every month just for spending a short amount of time.